James Taylor nous proposera un nouveau livre consacré à la SD1…et le premier livre dédié à la Rover 800. La SD1 est un sujet déjà longuement abordé par James Taylor, mais qui semble inépuisable. 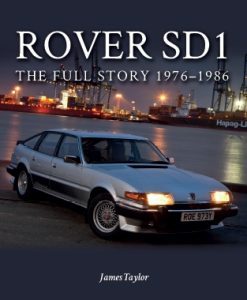 Disponible le 25 juillet prochain, le livre Rover SD1: The Full Story 1976-1986 abordera notamment les spécificités liées à chaque marché sur laquelle la SD1 a été commercialisée. Voici les notes de l’éditeur. Rover’s big hatchback saloon of the 1970s and 1980s had all the elements of a superb motor car. It was the work of long-standing Rover engineers, with substantial input from their colleagues at Triumph. The SD1’s top models even shared their V8 engines with earlier and much-loved classics from Rover. It was stunningly attractive, cleverly derived from Italian supercar styling and still extraordinarily practical thanks to its large hatchback configuration. In this new book, Rover historian James Taylor tells the full story of the SD1, warts and all, from initial concept to final production model. The oft-criticized early models and the more successful later variants are discussed as well as the exclusive Vitesse and Vanden Plas models and overseas and police variants. Finally, for those inspired enough to seek one out today, there is guidance on purchase and ownership. Le livre suivant, disponible le 26 septembre, sera intitulé Rover 800 Series: The Complete Story et sera le premier livre consacré à la carrière de la Rover 800. The Rover 800 grew out of a pioneering collaboration between Rover in Britain and Honda in Japan during the 1980s. This book tells the story of how the two companies worked together to produce the Rover 800 and its cousin, the Honda Legend. For those who remember the big front-wheel-driver Rover with affection, this book sets out the full history looking at the design and development of all models: saloons, Fastbacks and Coupes; the Sterling in North America; contemporary after market modifications; Police usage and export variants. 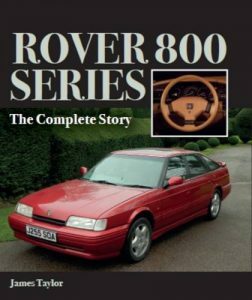 There is a helpful chapter on buying an owning a Rover 800 and the book is illustrated with 250 colour and black & white photographs.